Remarkable Service is not only for an elite hotel or a luxury car dealership. Any business in any industry can be remarkable. 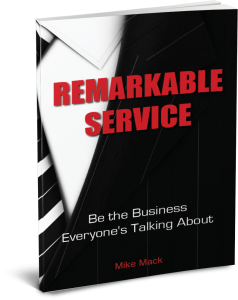 What is Remarkable Service? What are your customers remarking about? Why don’t more businesses create Remarkable Service? Is your business doing all it can to be remarkable? Learn what it takes to deliver Remarkable Service. Discover some of the little things that make a big difference. In good and bad economic times, Customer Service is the one thing that any business can control and improve upon 24/7, 365 days a year. Download the Remarkable Service Media Kit or download your free version of the book.